Natalie Wexler: Leaving Room for Improvisation. 18 Feb Natalie Wexler: Leaving Room for Improvisation. 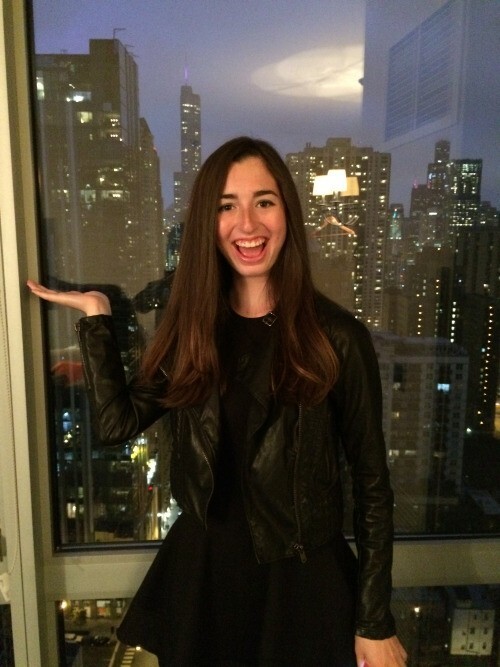 Meet Natalie Wexler, a 9th grader from Chicago, IL. She is a journalist for Sports Illustrated Kids and part of Second City Improv’s teen ensemble. As if that’s not impressive enough, she’s also launching her own app within the next few months and is writing a book about failure! Natalie is learning to code in order to find ways to help people communicate and make the world a better place. What did you want to be when you were 7 years old? What do you aspire to be now? When I was 7, I wanted to be a talk show host, rock star, designer, or chef! Now, I aspire to be an entrepreneur because I am interested in product development, marketing, and creative problem solving. What made you join a Girls Who Code Club? I am a member of my school’s business club – in fact, i’m the only girl – and we had an assignment to pitch different ideas for business. I thought of an anonymous communications app where people can talk about similar interests with no locations, names, likes, etc. My business club couldn’t make it so I decided to make it myself. I worked with a developer and also joined a Girls Who Code club because I want to be able to make something like this by myself. I also believe coding is the language of the future. What is the hardest part of learning to code? Of being a woman who codes? Learning to code is like learning anything new; the skills take time to develop and hone. How has coding made you feel more confident? I know that am developing a valuable skill. Coding is not only a skill that will be useful in my own life, but I know that it will be useful in future internships and jobs, too. It’s nice to have a marketable and valuable skill to offer prospective employers! Why do you think it’s important to teach girls Computer Science? I think that it is important for girls to learn computer science because we would be disadvantaged if we did not learn the languages of technology and the future. Last week a woman commented on one of Mark Zuckerberg’s Facebook posts saying that she encourages her granddaughters to “date the nerd” because he might turn out to be the next Mark Zuckerberg. Zuckerberg replied by saying that it would be even better for her to encourage them to become the inventors themselves. This anecdote illustrates some of the generational and gender gaps currently surrounding the technical fields. As more girls that learn to code, the ratio of men to women will become more equal. The more girls that know how to code, the more able they will be to create programs and products that appeal to them. After all, knowledge is power! What advice would you give to encourage a girl to learn to code. I don’t think people should stereotype the people that code. Athletes can be coders. Dancers can be coders. Chefs can be coders. Improvisers can be coders. Literally, anybody can be a coder no matter what other interests they have. Also, it doesn’t hurt to just try it! Coding is a very useful skill to have. If a girl learns to code, she can make the world of her dreams. Don’t get discouraged when you fail, because failures build up to something and it’s well worth it that you continued. Tell us about a time you overcame a failure? I failed to be cast in The Second City Youth Ensemble in the fall of 8th grade even though I had been part of the ensemble in 7th grade. How does coding tie to your passions? I love comedy and making people laugh. With improv, you’re going out there and really reacting with what the audience is telling you to do. Sometimes my ensemble will mess up and break on stage, laughing. That’s what improv is about: trial and error. Each time we perform, the audience is different and reacts differently. It’s amazing being able to do so many different things and have the outcomes be so different. In learning to code, it’s also about trial and error. I think coding is fun but it can be frustrating at times. Sometimes you’ll be working on a string of code for a long time and if it doesn’t work, it’s horrible! Coding is a constant puzzle. However, just last night I finished my first program and it was really rewarding to be able to see what I can make that actually does something.